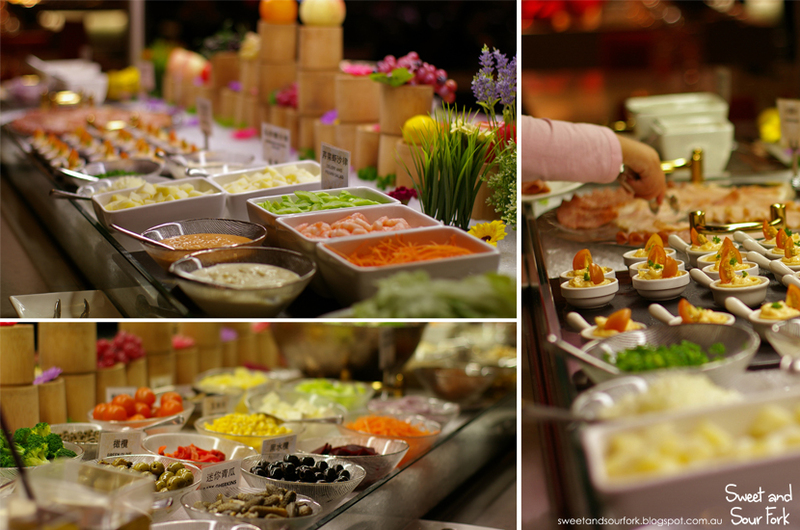 In a glut of gluttony like no other, Sophia, Bilge, Kathy, Sneha, Sarah, my sister and myself made our way to China Bar Signature in the CBD for their $33 Lunch Buffet ($29 Monday to Thursday). Standing proudly on the corner of Little Bourke Street and Exhibition Street, this newest member of the China Bar family had us all wondering how it compared to the one in Burwood. For starters, they had pulled out all the stops when it came to interior decorating. If Burwood was the smart-casual shirt and slacks combo, then this is a tailor-made three piece suit, complete with diamante cufflinks. It is fancy like it has its pinkie high up in the air. There are also two floors of greediness here. 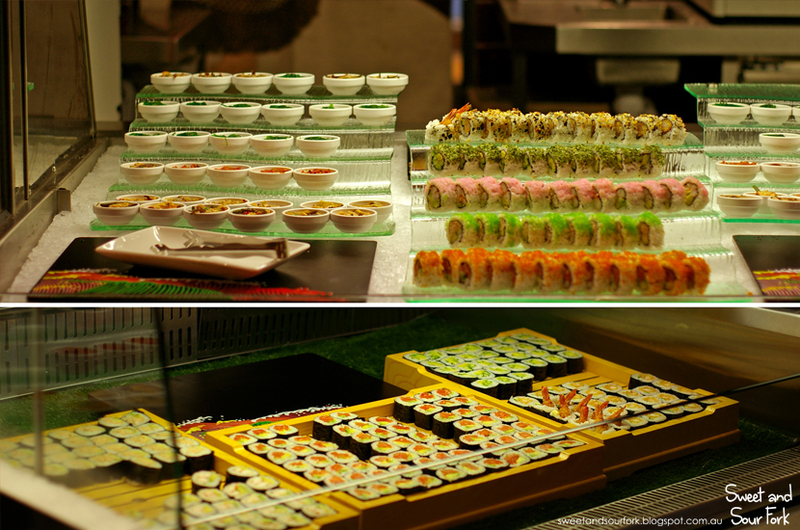 The downstairs is where the buffet, cook to order station, and sashimi bar is. And at night, the upper floor promises a grill bar and hot pot corner. Teaming up with my sister, we made a mighty good attempt at covering everything on offer. 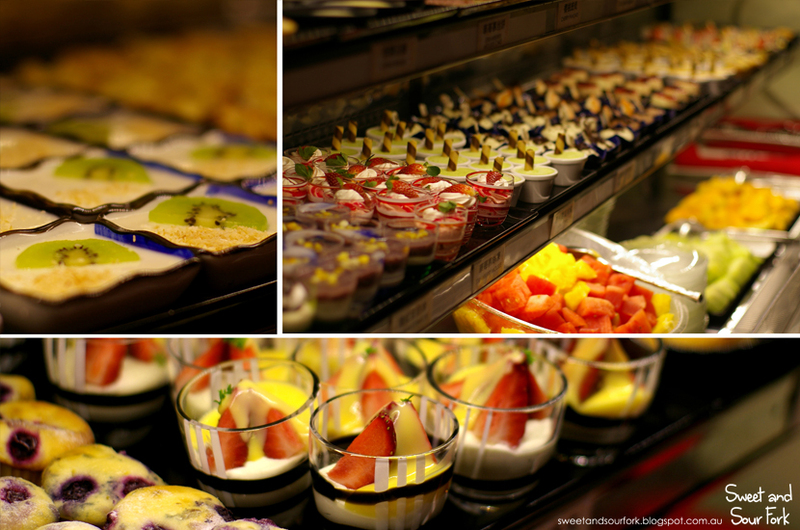 We skipped past the salad bar (naturally), which had enough on offer to rustle up any light meal of your choosing. We skipped the cook to order station too. As temping the Fried Koay Teow is, a whole plate would take up way too much stomach room. Instead we started with some dim sims. There was quite a lot on offer that we didn’t try, such as siu mai and spring rolls and peanut balls, but I was given positive feedback on all of them. Oh and, fair warning, the lighting was pretty dim at our table so photos aren’t top notch. Chicken Feet – A bit soggy from sitting out, but it was nicely marinated and will hit the spot if you happen to be craving them. Radish Cake – Nicely soft and crispy, this was at least as good as the kind you can buy from Asian grocers. Pan Fried Dumpling – It may be pretty much cold in the middle but the flavours were rather good, if not a tad too sweet. 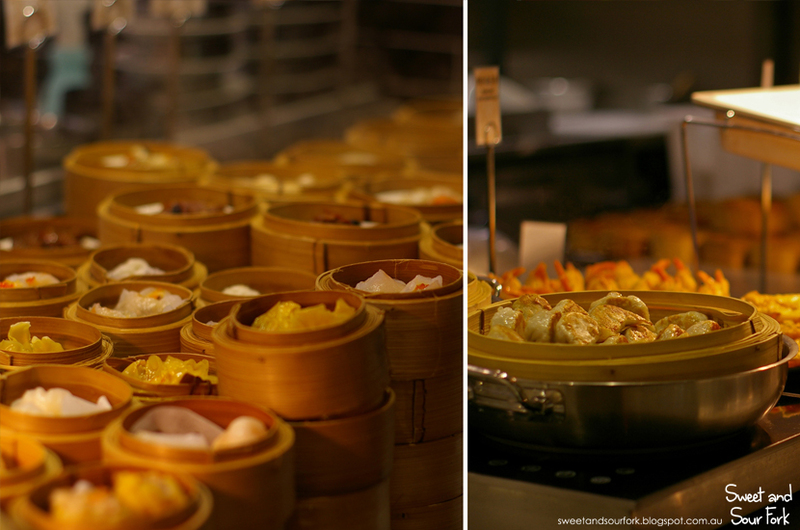 Prawn Dumplings – The China Bar must-have. But really, a must-have as long as it’s on the menu, and China Bar’s version just happens to be excellent. Aside from being slightly gluggy from sitting out, these small translucent parcels held large, juicy prawns that are just as good as any off a yum cha trolley. Japanese Fish Roe Dumpling – Pretty much the same as the prawn dumpling, but with a paste inside that I can only assume to be made of some sort of fish/fish roe? Chicken and Chinese Sausage in Bamboo Basket – THIS WAS A TRAP! Underneath the tender chicken and piece of Chinese sausage was a whole lot of rice, which is a big buffet no-no in my books! Flavours were nice but I would have preferred the Hainanese Chicken served at Burwood. Now onto the more substantial sushi, hot food, and roast meats! There isn’t much in the way of sushi at lunch time, mostly stock-standard salmon, tuna and Californian rolls; it’s the dinner session you want if you’re after serious seafood. The hot food selection is similar to Burwood. We skipped on a lot of the ho-hum offerings such as black pepper lamb and vegetable tempura. Thankfully the roast meats are still the same. Sushi – Food court stuff really, but a bit fresher. Soy Chicken – Tender with a nicely glazed skin. My sister rightly exclaimed that it tasted a bit like egg! Slow Cooked Pork Belly (the one that’s completely out of focus) – This was nicely melt-in-mouth from being slow cooked in a simple soy-based marinade. Sweet and Sour Pork Ribs – Once again nothing too different from food court offerings, but the meat to fat ratio was better than expected. Roast Pork – Arguably the best item on offer at China Bar if you’re here for lunch. Juicy tender meat that’s not at all dry, capped off with a thin shard of crackling that audibly shatters, despite having sat out for a while. Because this photo is extra blurry, I’ll list the items clockwise, starting from the mysterious brown stuff at the front. Baby Octopus in XO Sauce – The sauce was a bit salty; I much preferred the yummy chewy calamari rings at Burwood. Salmon Sushi – I’m sure it was nice but I literally stuffed it in my mouth and moved on. I don’t even know why I bothered. Prawn in Tomato Sauce – Once I realised that it wasn’t peeled, I left it as I didn’t want to get prawn fingers and sauce everywhere. I should’ve done what Bilge did and peeled it with my knife and fork. Otak Otak Fish Cake – It tasted like a flattened fish ball that’s been pan-fried, so that’s a win, even if it isn’t otak otak in any way. I didn’t realise until I bit into it that I shouldn’t be eating the leaf it’s wrapped in. Roast Duck – Juicy and tender, the only issue I have with roast duck is the inevitable difficulty of prying the meat off the bones. Roast Pork – Because ham, bacon and pork all come from one maaaaagical animal. One section that’s exclusive to the CBD is the cheese section. This is great for those of you who like to finish off your meal with something classier, or less sweet than durian icy poles. Aged tasty cheese, brie and blue cheese are served in little bowls with accompaniments of dried fruit, breadsticks, crackers, and mini toast. I enjoyed some creamy soft brie cheese on mini toast, topped with an olive. I can’t believe I’ve never done this before, the creaminess, saltiness and crunchiness comes together like a dream. In fact, it’s so wonderful that I went back for seconds. The tasty cheese was also good but the brie was much nicer, and I detest blue cheese so I ignored that. So far, I found the food at China Bar CBD to be of superior quality to what’s on offer at Burwood, but there are quite a few of my favourite things missing, such as the DIY Congee, Hainanese Chicken, and the Winter Melon and Pork Soup. There is also slightly less seafood in the hot dishes section; I saw none of the calamari and mussels that were served at Burwood. The cheese station however was a nice bonus. And now that I’m mostly done with the savouries, time to see how the sweets stacked up. On first glance, they’re definitely much more beautiful than the ones at Burwood. I just wish I could’ve seen the ones at the top. Black Forest Cake – This completely butchered my favourite cake. As opposed to fluffy sponge, lashings of cream, and large plump cherries, this was dense, sweet… and not much else. Honeydew Sago Pudding – This wasn’t too bad, it was decently light and had a nice honeydew flavour to it, but unfortunately the sago was more hard than chewy. Coconut Jelly – A light coconut jelly with a sprinkling of toasted coconut on top. It wasn’t specifically doing anything right, but it definitely did no wrong. One of the better desserts of the day. Chocolate Mousse – It was pretty dense for a mousse, so naturally it wasn’t fantastic. The chocolate taste is also a little bit lacking. Berry Panna Cotta – The panna cotta was way too tough; as opposed to being tofu-like, it was more akin to jelly with too much gelatine. The berry syrup was also much too sweet and, well, syrupy. Strawberry Romanoff – A quick Google search told me that romanoff is made of sponge fingers and mascapone. All I found in this was one a sort of custard jelly and some custard. That said though, this wasn’t all that bad, light and refreshing. Cherry Trifle – Once again, this didn’t have any distinguishing features aside from the little dollop of cherry compote on top. The most disappointing part was probably finding out that the green section wasn’t jelly, just part of the glass. Strawberry Mousse – This fared a lot better than the chocolate mousse, being lighter and having a stronger strawberry character. Creme Brulee – More like custard with speckles, and a faint whiff of brulee. So as it turns out, beauty is only skin deep. There were a few more desserts that I tried, but didn’t get a photo of, and most of them were on about the same level as the rest, with the green tea opera cake and lemon tart standing out just a little. 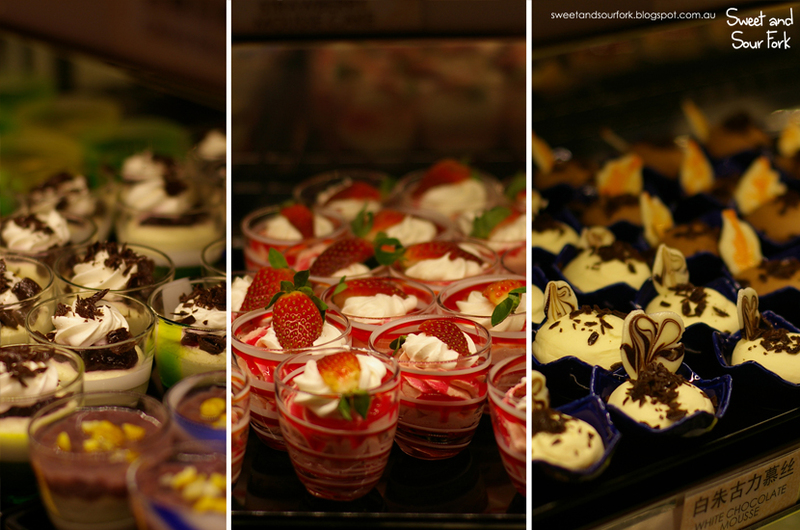 These desserts may have looked lovely, but they mostly tasted of cream and sugar and diabetes. So far, I’ve enjoyed the food here just a little less than I had at Burwood, with the desserts being especially disappointing. But a Chocolate Fountain can make me forgive a lot. Not only were there an abundance of strawberries, there were also loads of mini marshmallows, wafer sticks, chocolate buttons, nuts and more to garnish them with. The strawberries dipped in chocolate were a revelation. The fruits were ripe and juicy, probably already delicious on their own, but downright sinful after they’ve taken a dip in the fountain. I’m pretty sure we were responsible for eating most of the strawberries; I had a good dozen at the very least. I still can’t decide how sold I am on gourmet buffets. On one hand, the night session at China Bar promises everything from fresh seafood and sashimi to meats grilled on demand, Peking duck and even hot pot. Judging from previous experience, I know that the dinners are definitely worth going to at least once. But on the other hand, a dinner at China Bar is a whopping $69pp on weekends – enough to stuff yourself silly at most one hatted restaurants, and a few two hatted ones too. I’m pretty sure none of those restaurants have a chocolate fountain though. Rating: 14/20 – chocolate fountain of prosperity and joy. This looks amazing. I haven't been to the one at Burwood, but it was interesting to see an addition of the cheese section, which isn't very common in the Asian restaurants!